It’s huge too. Imagine a normal sized clock. Then add a starburst. Takes up a lot of wall space. But it is awesome, so that’s okay. I’m guessing this clock is from the 1960’s. Presumably made by Elgin Clock & Home Products of Chicago, Illinois, not to be confused with the Elgin National Watch Company, a.k.a. the Elgin Watch Company, formerly of Elgin, Illinois which moved to a suburb of Columbia, South Carolina, which was then renamed Elgin, South Carolina. Also not to be confused with the Elgin Clock Repair company of Elgin, Illinois. You see, this is why unique branding is so very, very important. Much less confusing when people are looking up things fifty years later. I love this clock! And yes, definitely sunshine yellow for the walls. Nice job! I was reading your blog while you were commenting on mine! Actually, I read your latest blog post, left the comment window open, ate lunch, then commented. 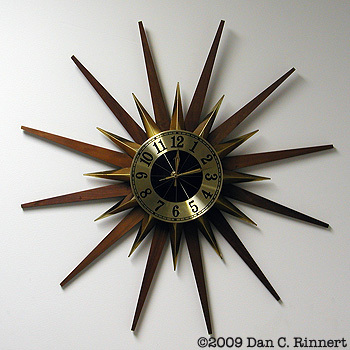 I’ve had this clock sitting in the basement for many moons. The teak bursts were still wrapped up. I put a battery in it many moons ago too, so it’s been running, but just resting atop a rolling cabinet. I decided yesterday to put it up, so I assembled it today and put it on the wall. Not the wall where I was originally intending to put it, but it will stay where it is until (or if) I get the other wall prepped. Is that the one with the spinning smaller sunbursts? Really freaky, that one. Remember seeing something like this growing up in at least one or two of my friend’s houses, so, I’ll say 60’s…. Nope. Nothing spins on this one, aside from the hands. These Elgin clocks seem to be generally dated from the 1950’s to 1960’s. I lean more toward the 60’s for this one because ones similar in design seem to be dated around the 60’s. So your memory probably serves correct! Too bad they didn’t stamp the date of manufacturing on these like they do for many things nowadays.